Before Your First Day | T.O.T.E. Your very first, First Day of School. And tomorrow’s the day! Years from now, you won’t remember it. That’s a lot to ask of a three year old. I’ll probably remember it forever. See, Love Bug, you are my oldest. My trailblazer. Everything you do is new, for you and for me. This makes everything both wonder-filled and terrifying. Climbing the jungle gym. Eating hotdogs. Talking. Walking, Running, Leaping… You amaze me every single day. And scare the daylights out of me. I think that’s probably why I’m already crying thinking about dropping you off tomorrow. It has nothing to do with you. You break me open every single day with your love and your trust. I’m exposed, and open, and I’ve never felt so vulnerable in my life. I have this little piece of my heart walking outside of my body… And now this Heart-Piece will happily skip away, to the new grand adventure called school. A large part of me wants to keep you all to myself, safe and protected, for all the days of your life. You are going to rock preschool. I know you will. At your drop-in day last week, I was bursting with things I wanted to tell your teacher about you. Awesome things, and hard things. Praises and warnings. I held my tongue, watched her show you how to use preschool glue. Watched you play with the dolls and read some books. Just watched. Because you are a sight to behold. And your teacher will see that. She will learn all about your awesomeness, and she will learn it from you. I’ve had three years for you to teach me. Three years to absorb your smiles and questions, your focus and determination. It’s time to share that with the world. A small world, albeit. So far. But this is just the very beginning. I love you. I am proud of you. There is so much you still need to know about this big, beautiful world. But even more that that, the world needs to know you. 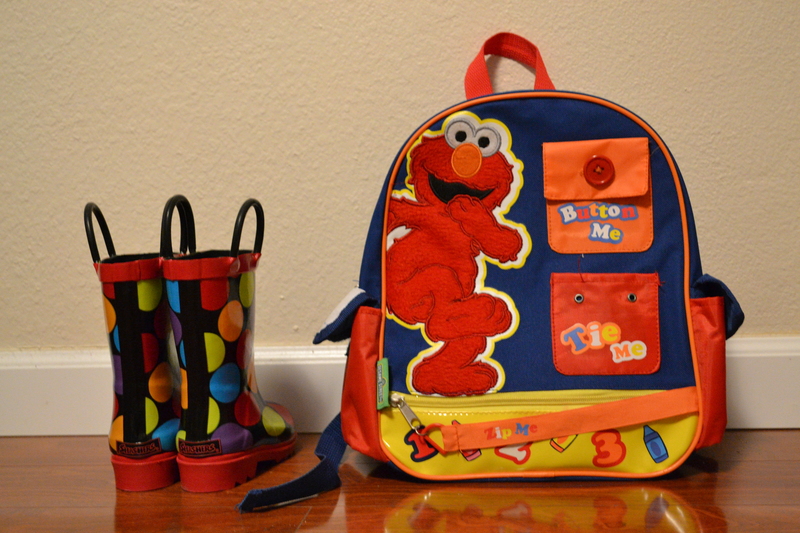 This entry was posted in Uncategorized and tagged Life, Mo Pic, Pre-School, Serious Stuff. Bookmark the permalink. Hi Caitlin, the news that today is Mo’s first day to school was a big surprise. How could that event happen already? Love her boots and Gonzo backpack!! Thanks for sharing her special news. Love and kisses to all you guys. Pingback: First Day! | T.O.T.E. Pingback: First Day and Forgiveness | T.O.T.E. Pingback: Last Day of Preschool | T.O.T.E.